The Bartow Museum, a project of the Bartow Community Club, is a fascinating collection of artifacts, documents and videos that invite you to look back 250 years to different times when things were done in different ways. The center piece of the Museum is the town's 1859 depot. Inside are four galleries filled with videos, panoramas, artifacts and displays. The Speir's Turnout Gallery covers the town and its railroad history prior to The Civil War; the War and Conflict Gallery includes American Indian relics, and artifacts from America's wars; The Town Gallery focuses on how people in and around Bartow lived during the early 1900s. And, The Famous Folks Gallery is filled with exhibits and videos concerning the bumper crop of famous folks who called this little farm town home. To schedule a tour, contact Patsy Jordan at 478-364-4030. AFTER YOU VISIT THE BARTOW MUSEUM, YOU WILL KNOW THE ANSWERS TO THESE QUESTIONS – AND MUCH, MUCH MORE. ♦ What Bartow pioneer was commander of all Georgia forces during the Revolutionary War? ♦ Which Bartow native’s creation was hailed by the U.S. Army as “the greatest contribution to winning World War II”? ♦ What best-selling Bartow author did the New York Times say “can write the crinolines off Margaret Mitchell”? ♦ What Bartow politician became governor, senator, judge, and U.S. Vice Presidential Candidate, and had a county named for him? ♦ Who was the professional boxer and wrestler from Bartow who became Europe’s 1930s dance sensation? ♦ What is Bartow’s connection with Walt Disney’s Donald Duck? ♦ What highly honored movie, starring Anthony Quinn and Shirley Booth, was based on a Bartow native’s biggest Broadway hit? ♦ What were Francis S. Bartow’s claims to fame? ♦ Which two Bartow natives created Atlanta largest public sculpture? ♦ Why, from 1905 until 1929, did Bartow houses have electric lights – but no electrical appliances, such as stoves and refrigerators? ♦ How large is the famous bell from General Wood’s fort? ♦ How did an Unknown Union Soldier come to be buried in Bartow? ♦ What best selling novel begins with a detailed, descriptive tour of Bartow? 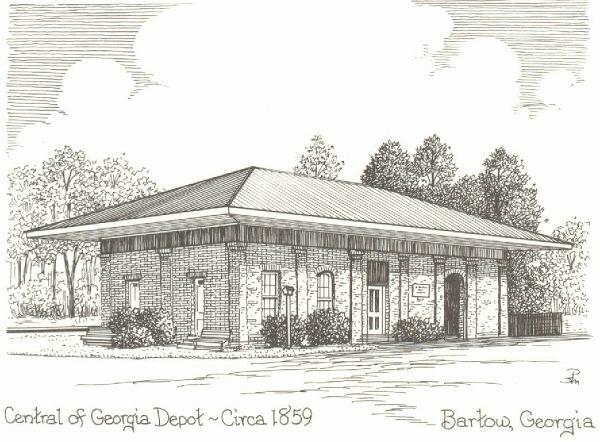 ♦ What were the town of Bartow’s three previous names, and why was it named Bartow? ♦ Why do antebellum houses usually have square columns, instead of round ones?